Tokyo (VNA) – Ho Chi Minh City’s Party Committee Secretary Dinh La Thang hoped that Japan’s Aichi prefecture will work with Ho Chi Minh City, where the investment climate has improved and young labour is abundant, to develop the support industry. He expressed his wish during a meeting with Governor of Aichi prefecture Hideaki Ohmura on April 11 as part of his ten-day visit to Japan. Vietnam wants to develop the support and automobile industries to boost the country’s position in the global value chain while Aichi prefecture boasts strengths in equipment manufacturing, he said. 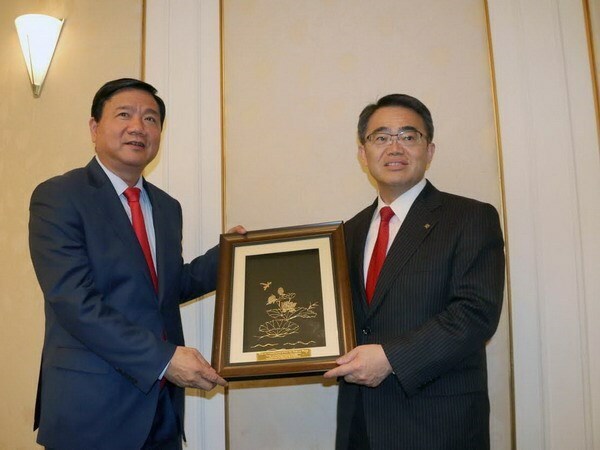 Lauding Aichi’s infrastructure projects under the public-private partnership (PPP) model, Thang said he was impressed with how Japanese locality mobilised private capital for public projects. He said that Ho Chi Minh City can learn from Aichi. Based on the friendship between Vietnam and Japan as well as sound cooperation between Ho Chi Minh City and Aichi, Thang hoped that Aichi leaders will create favourable conditions for Vietnamese expats who are working and studying in the locality. The Vietnamese southern hub will facilitate Japanese investment in the city, he added. For his part, Governor Ohmura affirmed that Aichi is willing to support Ho Chi Minh City in PPP projects. He wished for better collaboration between the two localities while hoping that Ho Chi Minh City will be a base for Aichi businesses to develop in Asia. The same day, Standing Vice Chairman of the municipal People’s Committee Le Thanh Liem and the city’s officials studied PPP projects in the prefecture, including the Kariya Highway Oasis- a highway stop area on the Isewangan Expressway, Chita Peninsula toll road, Chubu international airport and Aichi International Exhibition Centre.